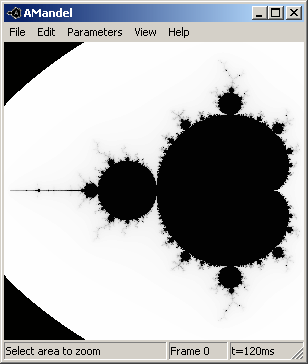 AMandel is an application that lets you view the fractal known as the "Mandelbrot Set", named after Benoit Mandelbrot. You can view any area of the set, with resolution limited only by the computer's processing capabilities. The main calculations are implemented in assembly language using the Floating Point Unit (FPU) stack and further optimizations for highest speed and performance. Features include Zoom capabilities, manually entering coordinates, saving image as bitmap, copying image to clipboard, printing image, traversing a history list of visited locations (zooms & unzooms), as well as loading and saving of coordinates for further explorations. To install AMandel, Double-Click the setup file. This will start a Setup Wizard that will guide you through the simple installation process. To uninstall AMandel, select Uninstall from the AMandel Start Menu group, if you selected this option during installation, or run Uninstall from the installation folder. Copyright (c) 1999-2016 by Amichai Rothman. All Rights Reserved. You may make copies, install and run it free of charge. You may redistribute it to others, complete and unmodified from its original binary form, as long as you do so free of charge as well. If you find this software useful please help support it by contributing a donation! If you like it, why not give something back? Please write in with any bugs, suggestions, fixes, contributions, or just to drop a good word and let me know you've found AMandel useful and you'd like it to keep being maintained. The main calculation (for each pixel) using the FPU follows. If you find any further optimizations, please let me know! Copyright © 1999-2016 by Amichai Rothman. All Rights Reserved.